A graphical representation of what characteristics a signal event in the CMS detector has that would be expected to pass selection. The dotted lines represent gluinos that move slowly due to their heavy mass. The jet from the decay is therefore delayed. How long do fundamental particles live? In the Standard Model, we know particles can have many different lifetimes; from the top quark which decays in less than a millionth of a billionth of a billionth of a second, to stable particles like the proton that live longer than the universe! As there is such a range in the lifetime, physicists have excellent reasons to expect other particles predicted by theories of new physics to have such a variety in non-negligible lifetimes. These ‘long-lived particles' can be vital in solving mysteries that remain in the Standard Model, like for example the matter/antimatter asymmetry in our universe. Long-lived particles can be charged or neutral, and many different approaches have been used at CMS to try to find traces of such particles at the LHC. In the case that the particles are neutral, they won’t interact with the detector and need to be reconstructed from the SM particles into which they decay. This requires using the CMS experiment in unusual and innovative ways. A new search for long-lived particles decaying to jets has recently been carried out by CMS using the dataset collected during the past three years (using the largest dataset ever recorded at a particle collider). 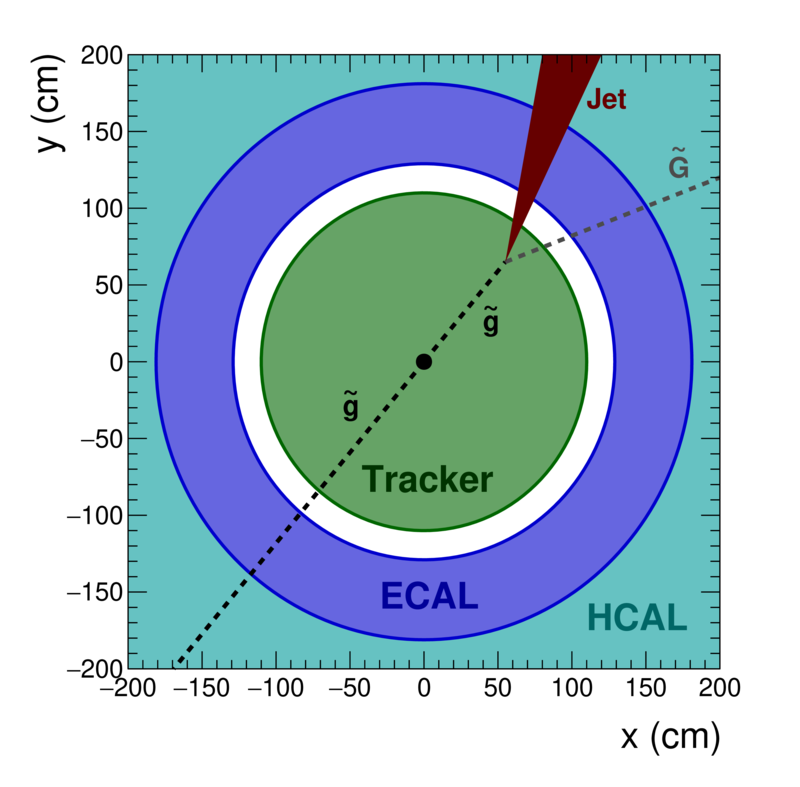 This search uses a new technique using the timing in the CMS calorimeter to identify ‘delayed' jets from the decays of a long-lived heavy particle. The results were first presented at the Rencontres de Moriond conference. Figure: A graphical representation of what characteristics a signal event in the CMS detector has that would be expected to pass selection. The dotted lines represent gluinos that move slowly due to their heavy mass. The jet from the decay is therefore delayed. The motivation to search for delayed jets is that if a new theory predicts massive, long-lived particles, these will move slowly through the detector before they decay into hadronic showers called jets. Their energy deposits are measured by the calorimetry systems which also record the time of arrival. Jets from the decay of heavy, slow-moving long-lived particles will reach the calorimeter later than the regular jets propagating at light speed straight from the proton collisions and are therefore called ‘delayed jets’. The exact value of the delay depends on the lifetime and the mass of the long-lived particle. Searching for unique signatures of new physics leads to interesting and unusual background processes that need to be understood, estimated, and rejected so that the analysis gains sensitivity to the signal and has as little background contribution as possible. One important background source comes from the galaxy as muons from cosmic rays can cause deposits in the ECAL which are out-of-time. Fortunately, CMS has excellent muon identification capabilities which can be repurposed to reject muons coming from the cosmos as well as reconstructing muons from particle collisions. An example event recorded by CMS which passes cosmic muon identification is shown below. ​Figure: The jet timing distribution for signals and background processes. Right of the line and arrow is where only very few collisions from the background are expected, making it a perfect check to see if there are any delayed jets. The events are selected such as to reject unwanted background processes while being enriched with desired signal-like characteristics. After the complete selection, unfortunately, no events survive that are consistent with the signal. Luckily, the results can still be used to place constraints on the many different types of physics models that can exist, and this is very helpful for physicists who design new models and also for those who conduct such searches. 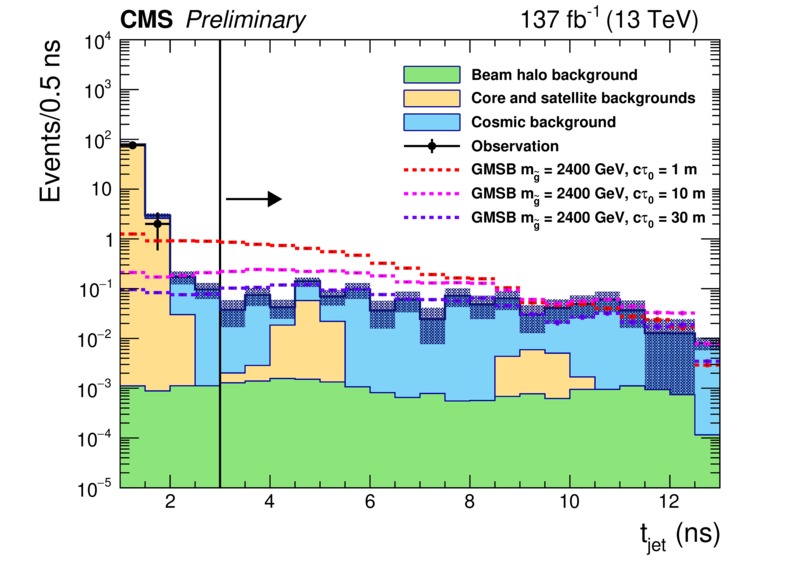 Finally, while we didn’t find any evidence for new physics in this dataset, exciting upgrades to the CMS timing capabilities are planned for the future, including a dedicated timing layer to come in 2026, which will allow significantly improved performance for a future search. This is likely the first application of a powerful new technique in our arsenal to search for long-lived particles.